The MightyMerchant™ Site Manager gives you control over your web site content. Changes to your web site will be applied automatically when you save your work. It's equally simple to add or edit products with pictures and pricing or add any other type of informational page. 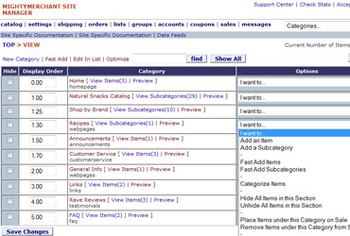 The MightyMerchant Site Manager gives you control over your web site content. You'll find that it's easy to use, clear and consistent, and quite powerful. and each announcement summary could be clicked to view the entire announcement. All of those changes to your web site will be applied automatically when you save your announcement. It's equally simple to add or edit products with pictures and pricing or add any other type of informational page. The site manager is packed with features that we designed to make updating your web site not only fast and easy, but fun! The MightyMerchant™ Site Manager gives you control over your web site content.